I had a good time with this book. 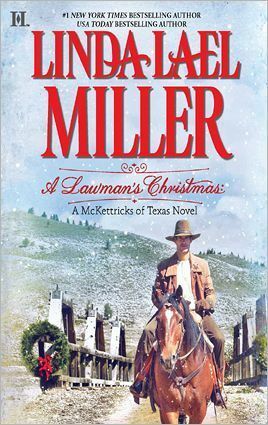 I have been a fan of Linda Lael Miller's writing for a very long time. I don't think that I have picked any of her books up in years though and I am pretty sure that I have never actually reviewed any of her work. I have enjoyed quite a few books from the McKettrick series so I was excited to pick this one up during a recent readathon. It ended up being a really enjoyable read for me. Clay McKettrick moves to a small Texas town to take on the role of marshal. He is immediately welcomed by the town but one little girl ends up making a really big impression on him. He quickly learns that the little girl is the daughter of Dara Rose. Dara Rose was married to the former marshal and has found herself widowed with two little girls to support and almost no money to do so. Now that there is a new lawman in town, she knows that she will have to give up her home so that he can have the house. Clay and Dara Rose were both great characters. Clay really is a good guy that just wants to do a good job. Dara Rose has been through a whole lot and has proven that she is tough and resourceful. Dara Rose always puts her children first and refuses to take the easy way out. I thought that these two were great together and I loved how great Clay was with the girls. I thought that their relationship progressed at a really nice pace and I was really happy with how everything turned out. I would recommend this book to fans of western historical romances. This book was filled with wonderful characters, a touch of humor, some Christmas charm, and some heartwarming moments. I really liked the fact that Linda Lael Miller worked some of less than pleasant issues from this time into the story including the plight of women and children without a male in the house and the impact of poverty. I definitely plan to read more from this wonderful author soon! The daughter of a town marshal, Linda Lael Miller is the author of more than 100 historical and contemporary novels. Now living in Spokane, Washington, the "First Lady of the West" hit a career high when all three of her 2011 Creed Cowboy books debuted at #1 on the New York Times list. In 2007, the Romance Writers of America presented her their Lifetime Achievement Award. She personally funds her Linda Lael Miller Scholarships for Women. i guess friends with benefits didn't come into popularity in the wild west? I have never read this author, but I did go to the online library last night and take out a ton of Harlequin Christmas romances to read. LOL This one sounds so good, and very indicative of the time period. I'm glad you enjoyed it. I thought that it was really well done, Angie! Cowboys can be a whole lot of fun! Her books are on the list for someday. This set up sounds just the thing for a Christmas read. I think you would enjoy this one, Sophia Rose! Do you know I used to devour series after series by Miller. I really should pick her back up. This sounds perfect for the season. I used to read tons of her books too! It's been forever since I've read one of her books. I had a good time with this one, Mary! I like the idea that there's more depth to this than just the romance and the author pulls in historical hardships to her story. I can't imagine being as strong as those women needed to be! It would have been so hard! Westerns can be a lot of fun! This sounds like such an enjoyable read! It was really nice to go back and read an author that I haven't picked up in a while.